Nate Diaz choked out Conor McGregor in the second round at UFC 196. After a first round that was won by McGregor, Diaz caught McGregor with a right hand that wobbled the featherweight champ. Diaz turned it on and rocked McGregor with punch after punch. After a desperate attempt at a takedown, McGregor was laid out on the ground and was smothered by Diaz. Check out the victory after the jump. Miesha Tate choked out former UFC Bantamweight champion Holly Holm in the 5th round at UFC 196, to capture the belt. Tate had nearly choked Holm out in the second round, but with just seconds to spare in the round she slipped out. Holm had come back to probably win the 3rd and 4th rounds. But after takedown attempt after takedown attempt, Tate finally got Holm down and went to work. Check out the chokeout after the jump. UFC 196 is only about 10 hours away and we have some predictions for the Pay Per View portion of the event. According to UFC President Dana White, this UFC is going to be one of the most bought ever. If you don’t think there’s any truth to that, Conor McGregor will be taking home the first $1,000,000 paycheck in UFC history. Imagine being Nate Diaz and getting $500,000 for getting pummeled for five minutes by Conor McGregor? Along with this crazy main event, the Women’s Bantamweight title is on the line. Holly Holm will be making her first title defense against Miesha Tate. It’s been nearly three and a half years since the Bantamweight title fight has not included Ronda Rousey. Conor McGregor KO’d Jose Aldo Jr. in 13 seconds to win the UFC Featherweight Championship at UFC 194. McGregor’s first punch landed on the chin of Aldo and that was all she wrote. 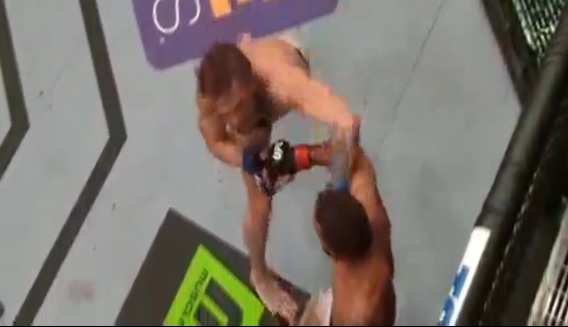 As McGregor connected with the monster left hand, Aldo also rocked McGregor with a right. Luckily for McGregor, he was able to withstand Aldo’s punch. All I can say is WOW. Check out the KO after the jump. Holly Holm KO’d Ronda Rousey at 59 seconds of the second round at UFC 193 with a monster head kick. Holm dominated Rousey from the opening bell with fantastic boxing and ultimately kickboxing. Holm’s victory is easily the greatest upset in MMA history. To be honest, I thought she was going to be just another name to fall to Rousey. But, she was completely dominant and fought the perfect fight. Hats off. Enjoy the KO. Ronda Rousey KO’d Bethe Correia at the 34 second mark of the first round at UFC 190 to retain her UFC Bantamweight title. Rousey, who is known as a submission specialist, rocked Correia with a series of combinations that ended with a huge right hand to the temple. Conor McGregor KO’d Chad Mendes at the end of the 2nd round to win the UFC Interim Featherwight Title at UFC 189. After spending essentially the entire second round on his back in the middle of the ring, McGregor escaped Mendes’s guillotine choke attempt and delivered a flurry of punches that ultimately led to the KO. The King is here. Robbie Lawler KO’d Rory MacDonald at the 1 minute mark of the 5th round at UFC 189 to retain his UFC Welterweight title. Lawler owned the first two rounds, but a head kick delivered by MacDonald in the 3rd, turned the tide. MacDonald continued the assault thought the 4th round and had Lawler tired. From the beating he took in the first two rounds, MacDonald had a badly bloodied nose. That nose could not take any more punches in the 5th round after Lawler landed a clean shot to the face.